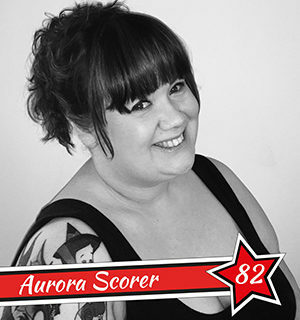 Aurora Scorer tells us about how she was seduced by roller derby before carving out her own non-skating niche in the team. I was told about roller derby by my friend Lucille Brawl who said it was fun and she loved it. Thing is, I can’t really skate and due to injuries and bad knees I didn’t think it was something I wanted to risk. Lucille then told me about the role of officials, that they were just as important as the skaters – without the officials the game can’t happen! I went along to a few training sessions, just to observe and get a feel for the game. I liked what I saw – there’s so much diversity and acceptance and it doesn’t matter what you look like… Plus the game itself is awesome and so exciting to watch! And I was invited to join the league after a standard probation period. Since then I’ve had a blast. I’ve been learning about all NSO (non-skating official) positions. I’ve attended bootcamps and met other awesome NSOs across the country and learnt loads. I’ve officiated for two lots of British Roller Derby Championships tournaments now and have done other bouts across the country. You meet so many people and everyone is so friendly and welcoming, it’s like being part of a little family inside your existing league family. I am now the leagues Head NSO, which means I’m responsible for other officials with their training and development. I love it and we always need more. If you’d like to try this role out, rather than skate, you’re more than welcome to contact me via recruitment@hertsrd.co.uk. We’d love to have you join us, on skates or off!